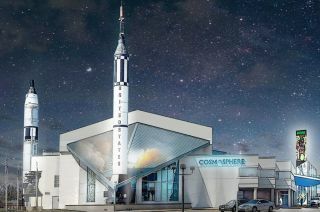 Artist concept of the Kansas Cosmosphere after its five-year, $15 million revitalization effort, including proposed lighting effects to make it appear that the museum's Mercury-Redstone rocket is launching. Liberty Bell 7 has left the building. The Kansas Cosmosphere and Space Center hoisted the historic Mercury space capsule out of its basement gallery and loaded it onto a truck bound for the museum's nearby restoration facility last Wednesday (June 18). Now there, it is being readied to ship overseas for a temporary exhibit in Germany later this fall. The museum, which for its first 50 years sought to "honor the past and inspire the future of space exploration," has adopted a new goal for its next half-century. Its aim now is to "inspire innovation through science education and honor the history of space exploration." "We'll remain a world-class museum telling the story of the space race in a way unlike anywhere else on Earth," said Richard Hollowell, Cosmosphere chief executive officer, in a statement. "Our primary focus is – and has always been – inspiration." "Our new mission and direction reflect our pledge to be a forward-looking, education-driven current institution whose message and programming has an international reach," he added. Workers load astronaut Gus Grissom's Mercury capsule, Liberty Bell 7, on a truck outside the Kansas Cosmosphere to launch the spacecraft on its journey to Germany, June 18, 2014. To launch this new mission, Cosmosphere officials have approved a five-year, $15 million revitalization plan that combines new educational programs focused on science, technology, engineering, and mathematics (STEM) with a number of the enhancements to the exhibits that comprise the Cosmosphere's Hall of Space Museum. "The Cosmosphere can play an even more important role in encouraging students to pursue STEM studies and to push the boundaries of their imagination," Steve Hawley, a former NASA astronaut and advisor to the Cosmosphere. "This is a unique resource for the state of Kansas and the region, providing a one-of-a-kind learning laboratory for students and life-long learners." In addition to the Liberty Bell 7, which the Cosmosphere helped to find, recover and restore 40 years after it sank to the ocean floor following its July 1961 splashdown from space, the museum displays the Gemini 10 and Apollo 13 spacecraft alongside hundreds of other U.S. and Russian artifacts. Those relics, Liberty Bell 7 included, will stay on display at the museum, though the way in which they are exhibited is set to change. "We felt the artifacts and the story that we tell are done in a manner that is unlike any other museum," Jim Remar, the Cosmosphere's president and chief operating officer, told collectSPACE. "We wanted to make sure we maintain that. But one of the things we hear routinely from visitors is that the exhibits not interactive enough or that there are no hands-on activities." The Cosmosphere plans to update the look and content of its Hall of Space Museum to incorporate immersive areas, combining historic artifacts with multimedia, refreshing the overall museum experience for visitors. "We are going to add audiovisual treatments [and] we will create immersive environments utilizing flooring as well as wall treatments," Remar explained. "We'll have interactive exhibits that go beyond pushing buttons and then having something happen. We want to relate the artifacts to the story and the visitor in a meaningful manner." The Cosmosphere plans to use of its under-utilized areas, including its lobby, to extend its focus beyond just space history. "We anticipate creating new exhibits that relate to current and future initiatives," Remar described. "What we hope to accomplish is that a visitor can come in and learn about the past, historical perspective of the space program, but then also use us as a resource for real time initiatives." Fundraising to begin the revitalization effort is set to begin soon. Should all go as planned, work will get underway on the renovation sometime in 2015. The plan, said Remar, is to stage it in such a way that a majority of the museum's exhibits remain open to visitors as the changes are made. Liberty Bell 7 will arrive in Germany at the end of August, where it will go on display at the Art and Exhibition Hall of the Federal Republic of Germany in Bonn Oct. 3 to Feb. 22. It is expected to return to the Cosmosphere by April and be placed back on display by Memorial Day 2015.